If art is about the personal vision of the artist or an exclusionary experience that separates those who get it from those who don't, Brütal Legend is a game that gets to be art. Set in a fantasy world that has nothing to do with Tolkien and everything to do with heavy metal bands and Frank Frazetta artwork, this action-adventure game is the latest creative endeavor of gaming auteur Tim Schafer. Schafer's games have always had a funky and distinctive style made up of snappy dialog, quirky characters and strange dreamlike environments. Brütal Legend satisfies all three Schafer distinctions to qualify as the work of an auteur. A lot of hype has been building around Brütal Legend, not just from fans of Grim Fandango and Psychonauts, but from metal rock enthusiasts with a penchant for video games who finally have a way to combine the two. This is where the "exclusionary" experience comes in: the jokes, the visual appeal and the characters are all aimed at a Metallica-era crowd. That doesn't mean every gamer born after 1986 won't find something to enjoy about the game; but they might be missing out on the full vision Schafer's set out to create. Take for example the lone mission demoed for games journalists at EA's Spring Break Event. It was actually the same level shown a week prior at GDC and many of the journalists in the room had already experienced it; but everyone seemed to want a second look just for the fun of it. I hadn't gotten a chance to see the game beyond a single art direction panel at GDC, so I came to it with a clean slate. It'd been a long time since Grim Fandango for me and I was curious to see what kind of game my boss was talking about. 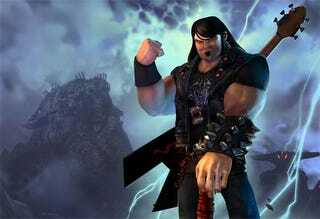 At first glance, Brütal Legend seems to be a brawler. Main character Eddie Riggs starts out with only an axe and his guitar, Clementine, so much of the combat looked like it would just be him running around and cutting things up or using Clementine for ranged attacks. The mission on display, however, was an early encounter with the "army" system where Eddie can recruit and control up to 30 people to fight for him. In this mission, Eddie is going to rescue some headbangers from the Crushing Pit mines where some dude named Lionwhyte has them enslaved. Technically, they're not enslaved – they're just demoralized to the point where all they feel like doing is slamming their heads against rocks. Eddie's job in this mission is to restore their spirits through the power of rock and send them around the mine trashing "motivational" statues that have kept the headbangers' spirits down. It was kind of a bummer to realize that I wasn't going to have anything new to report from what Brian Crecente observed during his GDC taste of Brütal Legend. Even more so when I was told the embargo date for covering the demo was almost a whole month away. But I did get to see how the level ended, which was apparently more than the GDC crowd got. Brütal Legend is much more than an action game with sharp writing and a heavy metal soundtrack. The end of the level comes when Eddie reaches the depths of the mine where a Bouncer threatens to kill all the remaining enslaved headbangers by toppling the "Wheel of Pain" platform that they're standing on into some lava. The Bouncer sends out his minions to shatter the supports around the platform, forcing Eddie to send his headbangers out to fight the minions while he defends one himself. Then comes the boss fight. After Eddie's done a decent job of defending the supports, somehow he winds up atop the Wheel of Pain to slug it out with the Bouncer. The game wants the player to use a certain strategy to defeat the boss by leading him under bins filled with rocks and knocking the rocks onto him – but it looked like Schafer got the job done just with basic attacks. After the Bouncer went down, Eddie still had to stop the minions from destroying the supports and somehow convince the rest of the enslaved headbangers to quit working now that their boss was dead. What happens next was really hard to understand without seeing the controls, but it looks like Eddie casts some sort of spell with the guitar that may or may not have been activated by the face buttons instead of the D-pad. Schafer apparently hinted at this guitar magic mechanic in the GDC demo, but despite having it seen it onscreen, I couldn't tell you how it works without seeing the controls. No tutorial buttons appeared and the animation that Eddie went into while rocking out on Clementine was only marginally different from the riff he plays to summon his army back to him. Whatever Schafer did triggered a cut scene where all the headbangers left in the mine, following Eddie to freedom. The ensuing cut scene I didn't understand at all, having not seen the story cut scenes prior to the mine level: Lars gets cold feet about rising up against Doviculus – Eddie's ally, Ophelia, limps up to them and passes out – Lars takes Ophelia and rides away, leaving Eddie to follow – and Lars's sister, Lita, seems concerned. My final impression of Brütal Legend based on this brief look at it left me with the feeling that I was missing something. A lot of things, in fact: the play-by-play GDC preview from 1UP that covers this mission says that the music playing in the background during the Bouncer fight is actually Def Leppard's "Rock of Ages," which might explain why so many of the other games journalists were smiling fondly during the boss fight. And while I laughed when one of the headbangers suggested that they call themselves Whitehead, "with an ‘e' on the end, so people will know we're not messing around," I feel like I'm somehow not cool enough to appreciate the joke fully. But even if I don't "get" Brütal Legend, I see no reason not to play it based on my brief encounter. It's a Tim Schafer game and that counts for something in this industry, right? I'm sure I'll find something appealing about the game even if I can't tell my Black Sabbath from my Judas Priest.